He?s known to filmgoers as Sallah from the Indiana Jones saga and Gimli from The Lord of the Rings... it's John Rhys-Davies! Jimmy Mac welcomes John into the Cantina to discuss his career in movies and his role as narrator of the new documentary Reclaiming The Blade. A fun look at the history of sword fighting in the real world and in film, Reclaiming The Blade also features the lightsaber, including an interview with Original Trilogy Stunt Coordinator/Swordmaster, the great Bob Anderson. Plus, John speaks candidly about working with George Lucas, Harrison Ford, and life on the set of some of Hollywoods biggest blockbusters. So pull a stool up to the bar for a fun-filled chat with Indiana Jones? 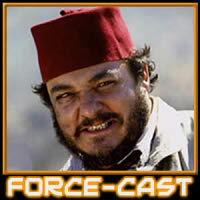 right-hand man as The ForceCast goes in the Cantina with John Rhys-Davies! Learn more about Reclaiming The Blade here. Official Pix: go to OfficialPix.com for the best in Star Wars photos and autographs.